Work has officially begun on the new Penzance Heliport that will become the helicopter gateway to the Isles of Scilly. 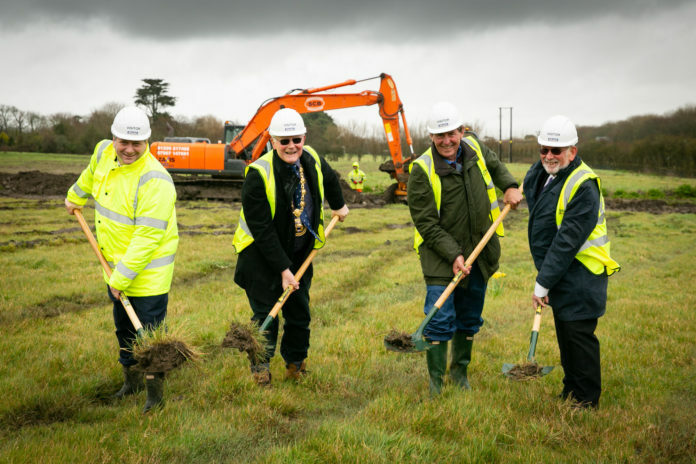 The first turf was cut on the site at Jelbert Way in a ceremony this week (Mar 18). The new heliport is adjacent to the previous heliport site and will reinstate direct helicopter flights between Penzance and the islands of Tresco and St Mary’s. Penzance Heliport says the new service will help extend the visitor season on the islands and make access to essential services easier for islanders throughout the year. It is estimated that it will help unlock £31 million of private investment in the Isles of Scilly, stimulate £10 million of economic activity in west Cornwall and provide around 30 permanent jobs. The heliport will also make use of local materials including sustainable timber, Cornish granite and native planting. Penzance Heliport has been awarded £1.8 million of European Regional Development Funding to support the project. The remainder of the project funding is from private investors. It will mark a welcome return of a regular helicopter connection to the islands. British International ceased their operation in 2012 and while Isles of Scilly Steamship Group reintroduced a heli-link last May, it announced in February that it was closing the service owing to a “lack of demand”.